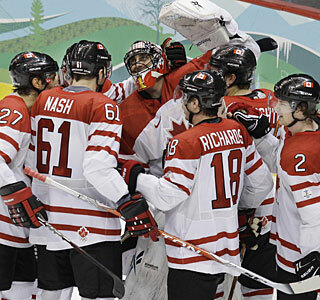 VANCOUVER—This was the best possible way to end the Olympics for Canada.Sidney Crosby, shut down most of the tournament, wristed a shot past Ryan Miller 7:40 into overtime after the United States tied it with 24.4 seconds left in regulation, and Canada survived a tense, taut game to beat the Americans 3-2 in the men’s hockey final Sunday. It capped Canada’s record gold rush in the Vancouver Games and set off a national celebration. In one of the greatest games in Olympic history, Canada’s collection of all-stars held off a young, desperate U.S. team that had beaten it the previous Sunday and, following a furious comeback after falling behind 2-0 on goals by the Blackhawks Jonathan Toews and Corey Perry, almost beat the Canadians again.With Canada less than a minute away from celebrating the gold medal, Zach Parise — the son of a player who figured in Canada’s finest hockey moment — tied it with Miller off the ice for an extra attacker.The moment he scored, the sighs of disappointed fans probably could be heard from Vancouver to the Maritimes. But Crosby, scoreless the previous two games, brought back the cheers with his second post-regulation game-winner of the tournament by scoring from the left circle that Miller was helpless to stop. He also beat Switzerland in a shootout during the round robin.It was close. It was nerve-racking. It was a game worthy of an Olympic hockey final. And, for the Americans, it was a monumental letdown.Before the game, Crosby received a brief text message from Penguins owner Mario Lemieux that said: “Good luck.” Now, Crosby joins Lemieux — whose goal beat the Soviet Union in the 1987 World Cup — and Paul Henderson, who beat the Soviets with a goal in the 1972 Summit Series, among the instant stars of Canadian hockey. At age 22, Crosby has won the Stanley Cup and the Olympics in less than a year’s time.Minutes after the game ended, delirious fans chanted, “Crosby! Crosby! Crosby!” and IOC president Jacques Rogge gave a raise-the-roof sign to the fans before presenting Crosby withhis gold medal. To win, Canada withstood a remarkable and determined effort from a U.S. team that wasn’t supposed to medal in Vancouver, much less roll through the tournament unbeaten before losing in the first overtime gold-medal game since NHL players began participating in the Olympics in 1998.Miller, the tournament MVP, was exceptional, and Parise scored a goal that — if the U.S. had won — would rank among the storied moments in American Olympic history.With less than a half minute remaining and Miller off the ice for an extra attacker, Patrick Kane of the Hawks took a shot from the high slot that deflected off Jamie Langenbrunner to Parise, who shot it off Roberto Luongo’s blocker and into the net.Parise is the son of J.P. Parise, who scored two goals for that 1972 Canada Summit Series team.Three minutes before Parise scored, Kane — who also set up Ryan Kesler’s goal in the second period — knocked the puck off Crosby’s stick on a breakaway that would have sealed it for Canada. Roberto Luongo didn’t outplay Miller, but still proved he is a big-game goalie — something he has never been previously — by making 34 saves in his own NHL arena. Luongo went 5-0 in the tournament and 4-0 after replacing Martin Brodeur following America’s 5-3 win the previous Sunday. NORTES—Now for the six Blackhawks in this tournament, it’s on to Uniondale,NY to face the Islanders Tuesday night unless any are given the night off by Coach Joel Quenville. STATE COLLEGE—Talor Battle had 16 points and six assists and hot-shooting Penn State easily exploited Northwestern’s defense in a 79-60 win on Sunday.Jeff Brooks added 11 points and seven rebounds for the Nittany Lions (11-17, 3-13 Big Ten), who shot 57 percent to secure its fourth straight win over the Wildcats. Juice Thompson had 21 points for Northwestern (18-11, 7-10). Their already faint hopes for a bid to the NCAA tournament were all but extinguished after a second loss this season to the conference’s last-place team.Only 3-point shooting went NU’s way during an otherwise terrible afternoon. They opened 7 of 11 from long range to stay within 27-24 with 7:45 in the first half.But the 3s stopped falling, and Penn State found holes in Northwestern’s zone.Penn State led by 14 at the half and by 25 with 8 minutes left in the game.Now the Cats must hope they haven’t blown a possible NIT birth with their late season free fall. Bulls cooled off by mediocre Pacers. 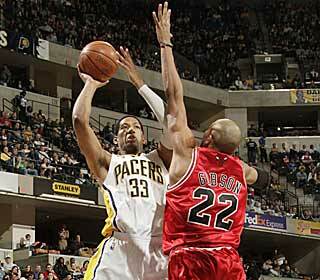 INDIANAPOLIS — Danny Granger and the Indiana Pacers haven’t given up on the season.Granger had 30 points and eight rebounds to help the struggling Pacers beat the Bulls 100-90 on Saturday night.The Pacers snapped a three-game losing streak and won for just the second time in nine games to improve to 20-39.Dahntay Jones and Troy Murphy each had 17 points, and Roy Hibbert added 12 for the Pacers, who avoided being swept by the Bulls this season in the teams’ four games.Derrick Rose had 27 points, and Luol Deng added 13 points and 18 rebounds for the Bulls (31-28), who trailed most of the game and fell behind by 16 in the fourth quarter.Indiana pushed a 12-point lead in the third quarter to 94-78 on Hibbert’s two free throws with less than five minutes left in the game. James Johnson’s 3-pointer got the Bulls to 96-88 with two minutes left, but four straight free throws by Granger and Murphy sealed the victory.The first half featured seven ties and two lead changes and neither team led by more than nine points. The Pacers took their biggest advantage of the half, 50-41, on Brandon Rush’s jumper late in the second quarter.Indiana stretched its lead to 12 on numerous occasions in the third quarter, including Murphy’s jumper to end the period.Taj Gibson finished with 14 points, nine rebounds and three blocks.Indiana capitalized on 21 Bulls turnovers. NOTES—Pacers C Jeff Foster (back) and F Tyler Hansbrough (ear infection) did not play….Deng was given a technical foul for arguing a call in the fourth quarter…..The Bulls host Atlanta Monday night. The Bulls stepped up in class Friday night at the United Center. Rather than playing bad teams like Indiana,Washington and Minnesota,they faced a very good Western Conference Portland team, and they committed 21 turnovers,many in key spots, but Derrick Rose and Luol Deng helped save them as they beat the Trail Blazers 115-111 in overtime to improve to 6-1 since the All Starr break. The Bulls led the entire first half,including by a point at half time. Rose was just shy of his career high with 33 points and Deng added 23 including 7 in overtime which the Bulls controlled. Rose put in a dozen in the fourth quarter,but just missed a floater just before the buzzer that could have avoided OT. The Bulls made up for the poor ball handling by out-rebounding the very athletic Blazers 43-19 including 11 by Joakim Noah who was hurting after the game and said he would not travel with the Bulls to Indianapolis for Saturday night’s rematch with the Pacers.LaMarcus Aldridge, once drafted by the Bulls,but quickly swapped for Tyrus Thomas, led Portland with 32,and Brandon Roy added 23 for Portland. VANCOUVER—Now, the rematch.Canada opened up a three-goal lead, then held off a late Slovakia comeback to win 3-2 in the Olympic semifinals on Friday night to earn a second chance against the United States in the gold-medal game.The unbeaten Americans routed Finland 6-1 earlier Friday but must beat favored Canada for a second time in eight days to win their first Olympic gold since the Miracle on Ice in 1980. Canada is going for its first gold medal on home ice.Canada endured a tense closing 10 minutes to win it after opening up a 3-0 lead that wasn’t threatened until Slovakia finally found its offense.Patrick Marleau, Brenden Morrow and Ryan Getzlaf scored in the opening 24 minutes to give Canada a seemingly safe 3-0 lead before Slovakia, an Olympic semifinalist for the first time, got goals from Lubomir Visnovsky and Michal Handzus less than four minutes apart in the third period.The Canadians played the game they needed to play to get to the game they simply had to play.For Canada, the thought of not winning a gold medal in its national sport at home was unthinkable. Not getting a chance to go for that gold because of a tournament-derailing 5-3 loss to the rival United States and its supposedly inferior team last Sunday was unfathomable.The Canadians didn’t come out like “gorillas from a cage,” as Russian goalie Ilya Bryzgalov described them after their relentless, aggressive offense produced four goals in the first period of a 7-3 rout of Russia on Wednesday. The no-risk Slovaks wouldn’t let them; Slovakia didn’t play a delay game, but they didn’t allow the Canadians much open ice or concede any possessions.With Canada’s deep pool of offensive talent, and goalie Roberto Luongo standing up to the few rushes the Slovaks managed until the final 10 minutes, it was only a matter of time.Marleau got the breakthrough first goal at 13:30 of the first, putting his stick up to redirect defenseman Shea Weber’s shot from the right point as goalie Jaroslav Halak reacted a millisecond too late. Canada waited a few anxious minutes for the replay to confirm that Marleau’s stick wasn’t above the crossbar, which would have negated the goal.Morrow, a contributor now after being Canada’s extra forward when the tournament began, made it 2-0 only 1:47 later when he deflected defenseman Chris Pronger’s knuckleball-like shot from above the left circle. Pronger also helped set up Canada’s third goal, a Getzlaf rebound on a power play early in the second that resulted from Richard Zednik’s holding the stick penalty.Luongo, winning his third in a row in his NHL home arena since replacing the benched Martin Brodeur, faced only nine shots in the first two periods and 21 overall but lost his shutout when Visnovsky scored at 11:35 of the third.And, finally after being quiet for so long, the puck. Handzus scored at 15:07, and a safe lead suddenly became a tentative one — especially when Pavol Demitra almost tied it in the final five seconds, only to have his shot sail wide.Canada patiently waited for chances and got them, with three goals manufactured by defensemen that resulted from traffic in front of the net, something the Canadians said beforehand was a necessity against Halak, who made 25 saves.Now, a week after Super Sunday, the Vancouver Olympics will end with Sequel Sunday.The NHL must be loving it as much the Canadian fans who, with 14 minutes left in the game, began chanting, “We Want U.S.A.!” The league takes a risk every four years that shutting down to send nearly 150 of its best players to the Olympics for two weeks will pay off in increased interest in hockey, especially among casual sports fans. It didn’t happen in 2006, when Sweden and Finland met in a gold-medal game largely ignored in the United States.This time, it’s the closest thing possible to a must-see game, at least in North America.Can the U.S. repeat its well-earned initial victory over Canada? Will the Canadians succumb to the pressure of playing a gold-medal game before its more-than-demanding home fans? Can the U.S. win an Olympic hockey gold outside of the United States for the first time, and on the 50th anniversary of its surprise victory in Squaw Valley, Calif., in 1960? 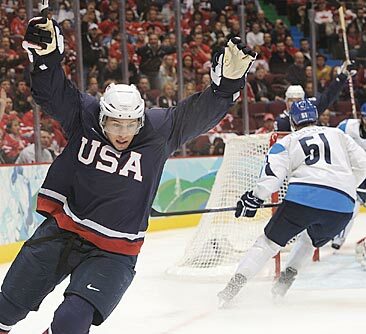 Can star Sidney Crosby, a Stanley Cup champion at age 21, add an Olympic gold at age 22? Then there’s this: Can the United States pull off the seemingly impossible by beating the favored Canadians not once but twice — and in Canada? Lose this game, in this setting and with all these stars, and Canadians may never get over it. Canada beat the U.S. 5-2 in Salt Lake City for the gold in 2002, but even that game lacked the buzz this one will generate because the U.S. hadn’t already beaten Canada.The way Canada’s playing now, outscoring Germany, Russia and Slovakia 18-7 since that U.S. loss, it probably will be favored again. And the Americans must try to do it a second time, all because of the second chance the Canadians created for themselves with their Olympic turnaround. Now, the rematch. Canada opened up a three-goal lead, then held off a late Slovakia comeback to win 3-2 in the Olympic semifinals on Friday night to earn a second chance against the United States in the gold-medal game.The unbeaten Americans routed Finland 6-1 earlier Friday but must beat favored Canada for a second time in eight days to win their first Olympic gold since the Miracle on Ice in 1980. Canada will be trying for its first gold medal won on home ice.Patrick Marleau, Brenden Morrow and Ryan Getzlaf scored in the opening 24 minutes to give Canada a seemingly safe 3-0 lead before Slovakia, an Olympic semifinalist for the first time, created a tense finish with goals from Lubomir Visnovsky and Michal Handzus less than four minutes apart in the third period. The Canadians played the game they needed to play to get to the game they simply had to play.For Canada, the thought of not winning a gold medal in its national sport at home was unthinkable. Not getting a chance to go for that gold because of a tournament-derailing 5-3 loss to the rival United States and its supposedly inferior team last Sunday was unfathomable.The Canadians didn’t come out like “gorillas from a cage,” as Russian goalie Ilya Bryzgalov described them after their relentless, aggressive offense produced four goals in the first period of a 7-3 rout of Russia on Wednesday. The no-risk Slovaks wouldn’t let them; Slovakia didn’t play a delay game, but they didn’t allow the Canadians much open ice or concede any possessions.With Canada’s deep pool of offensive talent, and goalie Roberto Luongo standing up to the few rushes the Slovaks managed until the final 10 minutes, it was only a matter of time.Marleau got the breakthrough first goal at 13:30 of the first, putting his stick up to redirect defenseman Shea Weber’s shot from the right point as goalie Jaroslav Halak reacted a millisecond too late. Canada waited a few anxious minutes for the replay to confirm that Marleau’s stick wasn’t above the crossbar, which would have negated the goal. If it worked once, Canada figured, why not try it again? Morrow, a contributor now after being Canada’s extra forward when the tournament began, made it 2-0 only 1:47 later when he deflected defenseman Chris Pronger’s knuckleball-like shot from above the left circle. Pronger also helped set up Canada’s third goal, a Getzlaf rebound on a power play early in the second that resulted from Richard Zednik’s holding the stick penalty.Luongo, winning his third in a row in his NHL home arena since replacing the benched Martin Brodeur, faced only nine shots in the first two periods and 21 overall but lost his shutout when Visnovsky scored at 11:35 of the third. Then, Handzus scored at 15:07, and a safe lead suddenly became a tentative one — especially when Pavol Demitra almost tied it in the final five seconds, only to have his shot sail wide.Then, the U.S. hadn’t already beaten Canada, and this Canadian team was hyped as the best since NHL players first began appearing in the Olympics in 1998. The way Canada’s playing now, outscoring Germany, Russia and Slovakia 18-7 since that U.S. loss, it probably will be favored again. That’s OK with American defenseman Jack Johnson, who said he heard zero talk before leaving for Vancouver that the United States would beat the Canadians.Now, the Americans must do it a second time, all because of the second chance the Canadians created for themselves with their Olympic turnaround. US ROUTS KIPRUSOFF, FINALND 6-1 TO ADVANCE TO GOLD MEDAL GAME SUNDAY. ***As the Winter Olympic Men’s Hockey semi finals start Friday, ALL SIX Blackhawks taking part still have their respective teams alive. Patrick Kane and the USA face Finland, followed by Canada with Jonathan Toews,Brent Seabrook and Duncan Keith facing Slovakia with Marian Hossa and Tomas Kopecky. That means all six Hawks will have two remaining games in Vancouver before they resume their “full time jobs” starting Tuesday night against the New York Islanders at Nassau Coliseum.With the Hawks also set to host Edmonton Wednesday and have three games in four days right out of the break, it’s possible that Coach Joel Quinville could give a couple of his Olympians a day off. ***Anti Niemi will start Tuesday night in goal against the Isles,and appears to have won the #1 goalie spot—at least for now. ***The Bulls,who have been playing some crummy teams of late, will step up in class Friday night with the Portland Trail Blazers at the United Center. ***Former Bull John Salmons is off to a good start as a Milwaukee Buck. He even led them in scoring Thursday night against Indiana. ***Ozzie Guillen has been “Tweeting” the last couple of days down at White Sox camp in Glendale,Az. How long will it be before Ozzie tweet’s something that the Sox organization will regret? EVANSTON—John Shurna scored 18 of his 29 points in the first half to lead Northwestern to an easy 74-57 victory over Iowa on Thursday night.After suffering a 78-65 loss at Iowa on Feb. 10, Northwestern (18-10, 7-9 Big Ten) took a big lead in the opening minutes with a number of easy backdoor layups, then Shurna followed with a barrage of 3-pointers.Shurna, who entered the night fourth in scoring in the Big Ten, gave the Wildcats a 23-9 lead with back-to-back 3s and Luka Mirkovic extended the lead to 31-11 on a rebound basket.NU made 11 of its first 14 field-goal attempts and shot 63 percent in the first half, taking a 39-19 halftime lead.Matt Gatens scored 15 points and Cully Payne added 10 for Iowa (9-19, 3-12). Robo Kreps scored 24 points and UIC rallied to defeat Wisconsin-Green Bay 78-71 Thursday night.The Flames (8-20, 3-14 Horizon) have won two in a row after losing 12 of their previous 13 games.The Phoenix (19-11, 10-7) led 32-24 at halftime and opened up a 14-point lead in the first 3 minutes of the second half before the Flames rallied.Zavion Neely added 18 points for UIC and Jeremy Buttell had 16 points and 11 rebounds. Kreps also had nine rebounds and went 8-for-8 from the free-throw line.Rahmon Fletcher had 17 points to lead Wisconsin-Green Bay. Troy Cotton had 15, Bryquis Perine 13 and Rian Pearson 12.The loss, combined with Wright State’s win at Youngstown State, ended Green Bay’s hopes of a second-place Horizon League finish.UIC won 82-80 at Evansville last Saturday on Kreps’ last-second basket. Anthony Hill scored 21 points and Ricky Franklin 20 as Wisconsin-Milwaukee defeated Loyola 63-61 on Thursday to split their season series.The Panthers (17-13, 9-8 Horizon) had a decided advantage at the free-throw line, hitting 17 of 26 attempts while Loyola was just 2 for 3.Geoff McCammon led Loyola (14-14, 5-12) with 22 points. Terrance Hill added 11.UWM trailed 30-21 at halftime but opened the second half on a 19-9 run to take a 40-39 lead on James Eayrs’ layup with 13:49 remaining.The teams traded leads for the next 11 minutes before the Panthers went ahead for good, 60-59, on Franklin’s layup with 1:52 left.Loyola won the first meeting between the schools, 69-64, on Dec. 5. Luol Deng scored a season-high 31 points, and the Bulls pulled away for a wild 120-110 victory over the Indiana Pacers on Wednesday night after blowing an early 23-point lead.Derrick Rose added 23 points and eight assists while tying a season high with nine rebounds as the Bulls won for the seventh time in nine games. They’ve picked on weaker opponents during this run. That’s about to change, though.They meet Portland on Friday, and after closing out the month at Indiana on Saturday, March opens with this brutal stretch: Atlanta, Memphis, Dallas and Utah all at the United Center, then trips to Orlando, Miami, Memphis and Dallas before hosting Cleveland.The Bulls were at their best in spurts on Wednesday.They led by 23 in the first quarter and were up 19 going into the second, only to watch it all disappear. Then, with a 58-54 halftime lead, they broke it open in the third and sent Indiana to its sixth loss in seven games.The Pacers’ Danny Granger finished with 20 points after missing Monday’s loss at Dallas for personal reasons. Brandon Rush hit 5-of-9 3-pointers and scored a season-high 21, including 12 in the second quarter as Indiana outscored the home team 36-21 to get back into the game.Then, the Bulls pulled away again and stopped any flashbacks to their epic collapse against Sacramento in December, when they blew a 35-point lead and lost.This time, they got a reverse layup from Brad Miller and jumper from Rose to start the second half. A few minutes later, the Bulls went on a 12-3 run that Deng finished with a 3-pointer, making it 83-67 midway through the third and putting them in control to stay.Early on, this looked like another blowout at the United Center for the Bulls, who had scored two of its most lopsided wins in its previous two home games. After tying a season high with a 33-point win over New York and beating Philadelphia by 32, the Bulls opened by hitting 13-of-23 shots in one of its most prolific quarters.Deng scored 11 in the first, converting a three-point play and tip-in to start a 16-2 run that made it 35-12 and just about buried the Pacers.Turns out, they had plenty of life after all. The team that couldn’t hit early on shot its way back in the second, making 10-of-20 field goals after going 7 of 24 in the first quarter.Rush led the charge, nailing 4 of 5 3-pointers and connecting from the outside with two minutes left in the half to tie it at 52. Dahntay Jones answered a jumper by Kirk Hinrich with two free throws to tie it again at 54 with 1:24 left, before a layup by Deng and jumper by Rose gave the Bulls a 58-54 halftime lead. NOTES—Pacers F Mike Dunleavy missed the game because of food poisoning….Joakim Noah, bothered by plantar fasciitis in his left foot, had five points in seven minutes — all in the first half. Canada routs Russia, faces Slovaks in Semis.